In today’s article 8 Ways to Burglar-Proof Your Home we’ll discuss ways to keep you and your home safe. 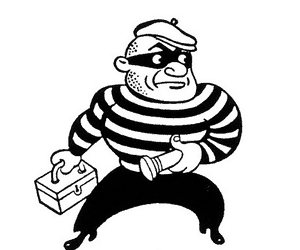 Statistics say that a burglary occurs every 15 seconds in the United States! Even though the time of the day may be random for the burglary to occur your home is likely been thought of well and prepared for in advance. Alarm System – This is probably the most obvious item of the 8 we’ll discuss today but it really does help. It may sound ridiculous but even an alarm sign in the front yard may be one item to further deter a burglar from choosing your home. The goal is to be the least appealing as possible as a potential thief makes their way through your neighborhood to pick a target house. Appear Occupied – Whether your home is occupied or vacant it’s imperative it appears occupied. A simple way to accomplish this is to setup a couple lamps throughout your home and put them on sporadic timers so lights go on and off at different times. Make sure to stop any mail if you’ll be gone for a period of time or put in a forwarding if you’re moving for good. Exterior lights should be on so as to light up your home around the perimeter. Make Yourself Anonymous – In today’s technological age it’s fairly simple to get a phone number from the internet and all you need is a name. Make sure to remove your name from your mailbox so thieves cannot get your phone number and call to see if your home. Install Proper Locks – It seems pretty obvious that deadbolts would be installed on the front door right? What about the back door or side garage door? All doors from the exterior to the interior should be properly secured with a steel dead-bolt that extends 1 inch or more into the frame. If you’re moving into a new home you’ll want to make sure to change the locks on all doors asap. On sliding glass windows, make sure that drapes are closed fully and that a stick or pin is placed in the track to not allow movement of the door. Gardening – Make sure to keep your lawn and bushes properly trimmed. Overgrown lawn and bushes sometimes can be an immediate green-light to a burglar to let them know the house might be vacant. Additionally, overgrown bushes make perfect hiding spots so trim them to ensure you’re not helping the thieves enter your home. Secure Your Windows – An easy way to secure windows including sliding glass windows is to pin them. If you’re a DIY’er then you can proceed but if not please contact a licensed professional to not cause additional damage. Creating a pin for the window is quite simple, click here to view a Youtube video on more information. Dogs – If you don’t have a dog then get one and the bigger the better. Make sure to provide proper access, supervision, water and food for any pet if you’ll be gone for any length of time. Other Items – Ensure items like bikes are picked up from the front yard, do not leave a wallet or purse on an entry table or within easy viewing of the front door or windows, securely store in a safe preferably or hidden area all items of value like cash, jewelry, etc. Insurance – Lastly, make sure you have proper insurance. If something does happen you’ll want to make sure you have the appropriate coverage to replace any items that are taken. Hopefully this article on 8 Ways to Burglar-Proof Your Home was helpful. As always if you have any additional questions please feel free to contact us anytime or leave a comment below.